We are one of the leading trader of a wide range of Nettipattam Wall Decor. These are fabricated using quality raw material. Further these can be availed at market leading price. - Ideal for home and office decor . Relying on our expertise in this domain, we are into offering Car Hanging Nettipattam. 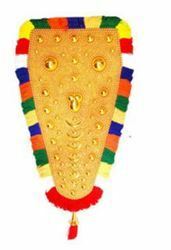 We are engaged in offering Wall Hanging Nettipattam. Relive a Kerala Temple Festival amidst richly Caparisoned Elephants and melam. Original Brass Nettipattom - headgear of elephants. For a Royal interior setting in your living room, hallway or office. Banking on our enriched industry experience, we are able to supply Nettipattam. We are engaged in offering Nettipattam 3.2 Ft.
VIGIL Arts & Crafts Training Center [SINCE:1981], offers Nettipattam [Gold plated Caparison] & Mural painting for sale at lowest price, within short duration irrespective of your location. We are a top-notch organization, engaged in providing Nettipattam. We are a top notch supplier of Nettipattam - Large (5 ft). - Weight : 0.8 kg.